DD Form 282 - also known as the "Dod Printing Requisition/order" - is a Military form issued and used by the United States Department of Defense. The form - often incorrectly referred to as the DA form 282 - was last revised on April 1, 1971. 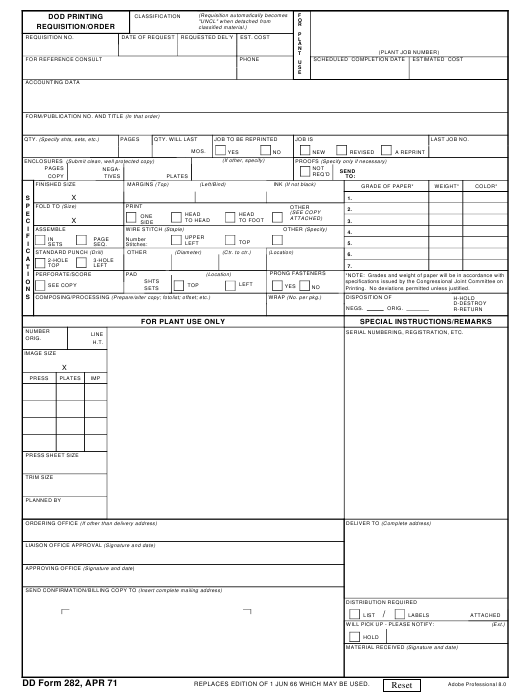 Download an up-to-date fillable DD Form 282 down below in PDF-format or find it on the Department of Defense documentation website. Printing. No deviations permitted unless justified. REPLACES EDITION OF 1 JUN 66 WHICH MAY BE USED.